Let’s be honest – lubing your motorcycle’s chain is one of those things you never do as often as you should. But did you know, you can get over three times the mileage from your chain (and to an extent your sprockets) if you regularly lube it up. If you are the lazy type or lack the skills, you can get your local garage to fit an automatic chain-lubing device, like a Scottoiler, which means you’ll never have to lube your chain again. Hooray! Some people say you don’t need to lube an O-ring chain, but they’re missing the point. The O-ring is sealed and helps keep the pins lubed but the plates also need regular lubing or they’ll oxidise, stick and wear faster. There isn’t a chain on the market that doesn’t require a small amount of maintenance from time to time. 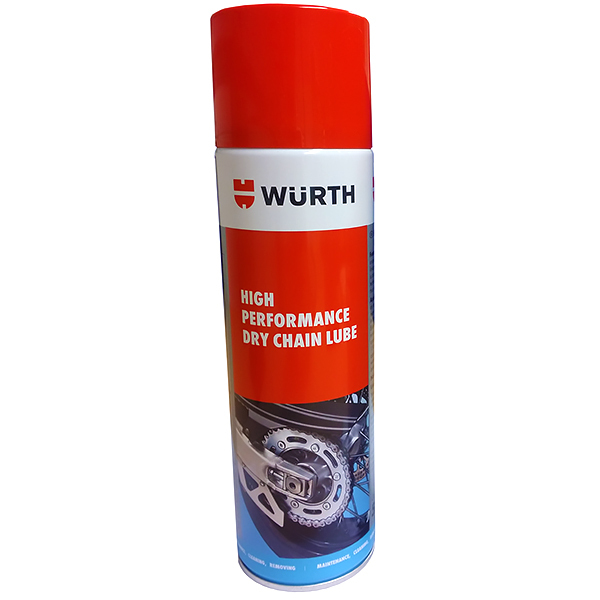 Wurth’s dry chain lube is actually a wax but it’s hard to tell. It goes on almost invisibly and penetrates the smallest gaps. It’s really hard to overspray as it is a very fine mist so there are no worries about fling. It’s made in such a way that dirt and grit won’t stick to the lube, meaning your chain life will increase. A high-penetrating wax that contains PTFE but doesn’t contain silicone. It’s water-repelling and designed to stay coated on your chain whatever the weather. Anti-fling formula and it’s suitable for all chain types. There are two main types of chain lube; a lube and a wax. The lube is like a sticky oil, it goes on in liquid form and stays liquid. A wax goes on in liquid form but will quickly solidify. Chain waxes are usually white in colour, whereas a lube is usually clear. Another good option is a dry chain lube. Dry is a bit misleading – it’s still liquid but it comes out as more of a spray than a liquid, coats the chain well and is hard to overspray. But some people prefer a good old ‘wet’ chain lube which has greater longevity, especially in wet weather. First of all, it makes sense to use a chain cleaner spray and a special chain cleaning brush to clean your motorcycle’s chain before you lube it. Well yes – as road crap builds up in your chain, if you spray fresh lube over it, you’re just creating an abrasive paste to help wear your chain out faster. So a quick spray with chain cleaner and a little scrub will do wonders for your chain’s life. When it comes to applying lube or wax, you apply them both in exactly the same way – ideally on a warm chain. One of the issues with a chain wax is fling. You wax up your chain, go for a ride and when you come home, the underside of your pillion seat looks like a plasterer’s radio – chain wax splatters everywhere. One of the issues is that the wax dries quite quickly and doesn’t penetrate as well as a lube on a cold chain. If you apply your lube or wax after a ride, with the chain nice and warm, the lubricant gets to penetrate that bit better instead of sitting on top of the chain and – in the case of chain wax – it lowers the amount of fling. We find the best way to apply lube is with the bike parked up, engine off. If you have a centre stand or a paddock stand, you’re in luck but if you have a side stand, you can make the job a lot easier with one of these motorcycle wheel spinners (which also come in really handy if you’re cleaning your bike’s wheels). Spray along the top of the chain from the front sprocket to the rear and with your spare hand, hold a rag under the chain to catch any overspray. Then roll the bike forward until the unlubed half of the chain is on the top and repeat. It takes less than a minute – simple. The lazy way to apply chain lube, is to stick your bike on its centre stand or a paddock stand, let it tick over in first gear and spray away. This is fine, all the time you’re paying attention and your sleeve, oily rag or fingers don’t get caught in the sprocket. If you have an iron stomach, search Google for ‘motorcycle chain lube injury’, but be warned – the images are brutal. The other drawback with this method is that it’s so easy to overspray, saturating your chain and guaranteeing you’ll be wasting time cleaning all the splatter off, following your next ride. If you’re touring, pack a small tin of chain lube in with you. This 50ml Muc Off Chain Lube will do 2 to 3 coats or this Motul Chain Paste is the size of a big tube of toothpaste and will do the job well too. An automatic chain oiler like this Scottoiler will ensure you get maximum life from your chain. At around £100, it might not save you money over the manual method but it is hassle-free. A chain that’s too tight or too loose will wear prematurely – when you lube your chain, check it and adjust when required. Check out your bike’s manual for their guidance. Once every 200 miles is what most manufacturers recommend. There are differing opinions on how often you should lube your chain, however, if you lube your chain once a month, you’re doing way better than most. However if you’ve ridden in wet conditions, you’ll need to lube it more frequently. Likewise, if it looks dry, give it some lube. Can I use bicycle chain lube on my motorcycle? If it’s all you have to hand, it’s better than nothing. Most bicycle chain lubes are dry and are more expensive than motorcycle chain lubes, so it’s not a good idea to splurge all your expensive bicycle chain lube on your bike. Can engine oil be used as chain oil? We definitely wouldn’t use old engine oil, as it contains a perfect mixture of particles to knacker your o-rings. We wouldn’t use engine oil either as if it flings off the chain, it’ll end up on the back tyre and you’ll risk tipping off. If you were in the middle of nowhere, worried about your chain and all you had was engine oil, you could pour a bit onto a rag and carefully apply it to the side plates to prevent them rusting – but really, try to avoid using engine oil on your motorcycle’s chain. Can I use ordinary grease on my chain? We wouldn’t recommend it – it’ll attract way too much road crud which will work its way into your chain and prematurely wear it out. Can I use a wire brush to clean my chain and remove any rust? It’s best to avoid a wire brush as it can get its way into the gaps between the plates and damage the rings. Use a soft plastic or nylon brush. A specific motorcycle chain-cleaning brush helps make the job a lot easier. Can I lube my chain with WD-40? Again it’s not advisable to. 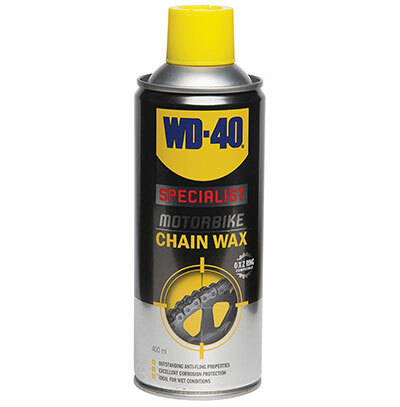 In fact, giving your chain a coating of WD-40 is a really good way of loosening up the dirt before you clean it. If you don’t have a chain cleaner, WD will do the job well but it’s best to use a lube after you have cleaned off the WD-40. How long does a motorcycle chain last? This really depends on a few variables: the quality of the chain, how well you maintain it and where you ride. For the average road rider, riding in all conditions with a well-maintained and quality chain – you should get 25,000 miles from yours. If we were looking at buying a second-hand bike, on its original chain with 10,000 miles on the clock, we’d be looking at replacing that. If you fit a brand new quality chain and never maintain it, you’ll need to replace it at around 10,000 miles too. Can I use petrol to clean my chain? The short answer is yes but it’s risky. Petrol is highly flammable, attacks the rubber o-rings in your chain, is a fire risk and is generally not a nice thing to inhale. If you have access to paraffin, that’ll do the job well and won’t attack the rubber o-rings. We researched and wrote this motorcycle chain lube guide with help from the following websites.